"Geneva (ENI). Religious beliefs have a profound influence in shaping men, including their sense of masculinity and sexuality, members of an interfaith panel have said at a gathering promoting positive masculinity held in Georgetown, Guyana. Religious institutions prescribe boundaries, impose sanctions and affirm identity, the panellists said. The meeting initiated a process of education for action in response to gender-based violence and coincided with an awareness campaign in Guyana aimed at "stamping out" gender-based violence, the World Alliance of Reformed Churches said in a statement. In remarks at the opening of the event, Guyana's Minister of human services, Priya Manickchand, challenged churches to work in partnership with other faith groups and specialised agencies to make a difference in the communities they serve." Ecumenical News International, 27 January 2009. It is good to love and serve your country. But fanatical nationalism is no longer a sensible option. In this day and age, everyone is a global citizen, and we all share the global web of life. This is a religious as well as a social issue. "The 3rd WFTL will be a meeting for a theology of sustainable life on Earth. It will have to make a theological reflection and discourse on the basis of a very concrete and organic meaning of life, since the analysis of the social and political reality in the Amazonian context promotes a direct relationship with the earth, water and biodiversity and reveals the limits and alternatives of the relation of human beings with their immediate environment." "The World Social Forum is an open meeting place where social movements, networks, NGOs and other civil society organizations opposed to neo-liberalism and a world dominated by capital or by any form of imperialism come together to pursue their thinking, to debate ideas democratically, for formulate proposals, share their experiences freely and network for effective action. Since the first world encounter in 2001, it has taken the form of a permanent world process seeking and building alternatives to neo-liberal policies." "The World Economic Forum is an independent, international organization incorporated as a Swiss not-for-profit foundation. We are striving towards a world-class corporate governance system where values are as important a basis as rules. Our motto is ‘entrepreneurship in the global public interest’. We believe that economic progress without social development is not sustainable, while social development without economic progress is not feasible. Our vision for the World Economic Forum is threefold. It aims to be: the foremost organization which builds and energizes leading global communities; the creative force shaping global, regional and industry strategies; the catalyst of choice for its communities when undertaking global initiatives to improve the state the world." EMAN 2009: Environmental Accounting and Sustainable Development Indicators Conference, 23-24 April 2009 in Prague, the Czech Republic. Please visit the conference website for more information. Point of contact: EMAN2009. First European Conference on Sustainability Transitions: Dynamics & Governance of Transitions to Sustainability, 4-5 June 2009, Felix Meritis, Amsterdam, the Netherlands. Point of contact: KSI2009. The international IMPETUS Africa Conference, "Global Change in Africa - Projections, Mitigation and Adaptation," will be held from June 2nd to 5th 2009 at the University of Cologne, Germany. For further information, please visit the conference website or email Africa Conference. The Air & Waste Management Association’s 102nd Annual Conference & Exhibition (ACE), 16-19 June 2009, Detroit, Michigan. For more information visit the AWMA-ACE2009 conference web site or contact AWMA-ACE2009. Conference Dates: 18-19 June 2009. Location: Lingnan University, Hong Kong, China. Sponsored by the Centre for Asian Pacific Studies (CAPS) and the Environmental Studies Programme (ESP) at Lingnan University, Hong Kong. Visit the conference website for more information, or contact CAPS. International human ecology conference at Manchester University, UK, June 29th - July 3rd, 2009. For conference information visit the Society for Human Ecology (SHE) web site. Point of contact: Ian Douglas. The 20th annual meeting of the Society for Economic Dynamics will be held 2-4 July 2009 in Istanbul, Turkey. For more information see the conference website or contact SED. The International Sustainable Development Research Society (ISDRS), Utrecht, The Netherlands, 5-8 July 2009. See the conference flyer and the conference website. Email contact: FBU Conference Office. The Sexual Violence Research Initiative (SVRI) is pleased to invite you to its first conference, to be held in Johannesburg, South Africa, 6 - 9 July 2009. For more information and points of contact, visit the SVRI Forum 2009 and the SVRI web site. Society for Conservation Biology, 11-16 July 2009, Beijing, China. See the CONBIO meeting website or contact SCB2009 . The 2009 conference of the International Society for Systems Sciences (ISSS), is to be held in at The University of Queensland, Brisbane, Australia, 12-17 July 2009. Focus on sustainability. For further information and registration visit the conference website. International Society for the Study of Religion, Nature & Culture (ISSRNC). University of Amsterdam, 23–26 July 2009. Conference director: Kocku von Stuckrad. Contact: ISSRNC2009. International Conference of the System Dynamics Society, 26-31 July 2009, Albuquerque, NM. Visit the conference website and contact the Program Chair. The Oslo Summer School in Comparative Social Science Studies 2009. A course on "Liberation and Participation: Theory and Method for a Social and Political Community Psychology." Lecturer: Professor Maritza Montero, Universidad Central de Venezuela, Caracas, Venezuela. Dates: 27 - 31 July 2009. The syllabus for the course is already posted. For more information: Professor Hilde Eileen Nafstad. International Society for the Sociology of Religion, Santiago de Compostela (Spain), 27-31 July 2009. See the conference website for more information. The point of contact is Hilde Van Meerbeeck-Cravillon. The 4th Annual Green Economics Conference will take place at Mansfield College, Oxford University, 31 July to 1 August 2009. Please email us at Green Economics Institute if you want to book or speak or reserve a place. Tunza International Children’s Conference on the Environment, Daejeon, Korea, 17-21 August 2009. For more details visit the Tunza web site or contact the Tunza staff. International Association for the Psychology of Religion (IAPR 2009), Vienna, Austria, 23 to 27 August 2009. Local organizing committee: Susanne Heine and Herman Westerink, University of Vienna. Royal Geographic Society, 26-28 August 2009, Manchester University, UK. Website: AC2009. Abstracts: Louise Reid and Tom Hargreaves. The Association for Feminist Ethics And Social Theory (FEAST), 24-27 September 2009, Clear Water Beach, Florida. Panels on "Environmental Feminism" and "Evolutionary Psychology." Questions may be directed to Lisa Schwartzman. The International Union for the Scientific Study of Population (IUSSP), 27 September - 2 October 2009, Marrakech, Morocco. For more information, visit the conference website and contact marrakech2009. International Seminar on Islamic Thought, National University of Malaysia, Bangi, Selangor, Malaysia, 6-7 October 2009. For more info visit the conference website. CFP: Women, Leadership and Mosques: Changes in Contemporary Islamic Authority. Oxford University, 16-17 October 2009. Please send proposals to Hilary Kalmbach. International Conference on Knowledge Economy, South Africa, October 20 - 22nd. See the Carmen Fitz-Gerald. Discoveries in the Scientific Study of Religion, Denver, 23-25 October 2009. Visit the SSSR2009 conference website. Point of contact: Kraig Beyerlein, Program Chair. International Conference Africa GIS2009, 26– 29 October 2009, Kampala, Uganda. For more information, please visit the AFRICAGIS2009 web site and contact AfricaGIS 2009. The world's climate neutral Scientific Climate Conference, 2-6 November 2009 online. Organized by the Hamburg University of Applied Sciences. For more information, visit the CLIMATE 2009 donference website and contact the conference staff at CLIMATE 2009. Note: the website already includes a listing of climate studies available at the Climate Change Studies Library (CCSL). Parliament of the World's Religions, 3-9 December 2009, Melbourne, Australia. Key topics: Healing the Earth with Care and Concern, Reconciling with Indigenous Peoples, Overcoming Poverty in a Patriarchal World, Securing Food and Water for all People, Building Peace in the Pursuit of Justice, Creating Social Cohesion in Village and City, Sharing Wisdom in the Search for Inner Peace. For more info: PWR2009. International Sociological Association (ISA) World Congress of Sociology, 11-17 July 2010, Gothenburg, Sweden. Session on "Peace, Conflict, and Climate Change" currently scheduled for Wednesday 14 July 2010. See the conference web site for more details or contact the conference chair, Hans Joas, Universität Erfurt, Germany. International Association for the History of Religions (IAHR), 15-21 August 2010, Toronto, Canada. Visit the conference website. The conference director is Professor Donald Wiebe. The International Association for the Study of the Commons (IASC) is accepting for hosting the 13th Biennial Conference, Summer or Autumn 2010. For more information contact Jim Robson and visit the IASCP website. The International Ecumenical Peace Convocation (IEPC) will be the Harvest Festival of the Decade to Overcome Violence and at the same time a planting season for fresh initiatives. May 2011, Kingston, Jamaica. Sponsored by the World Council of Churches (WCC). Visit the IEPC web site, which provides points of contact worldwide. CFP on Sustainability Science. 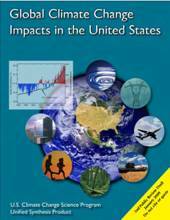 Proceedings of the National Academy of Sciences of the United States of America (PNAS). PNAS has launched a new section of the journal dedicated to sustainability science, an emerging field of research dealing with the interactions between natural and social systems, and with how those interactions affect the challenge of sustainability: meeting the needs of present and future generations while substantially reducing poverty and conserving the planet’s life support systems. PNAS seeks original research contributions for this new section on both the fundamental character of interactions among humans, their technologies, and the environment, and on the use of such knowledge to advance sustainability goals relevant to water, food, energy, health, habitation, mobility, and ecosystem services. PNAS welcomes outstanding sustainability science papers addressing spatial scales from the global to the local and drawing on a wide range of disciplinary and multidisciplinary approaches. For more information, please contact Josiah Armour. For thousands of years women have suffered from the consequences of social prejudice. This applies both to civil and religious realms. Our world is still suffering from the consequences. Liberation must ultimately come from a new self-awareness among women themselves, a self-awareness fostered by knowledge and insight. Catherine of Siena Virtual College offers courses that will empower women to understand their own situation and to change the world for the better. These courses will also enable men to serve all members of their communities more effectively. The film is based on a real life story from Malawi. It shows that providing potable water is essential for development. 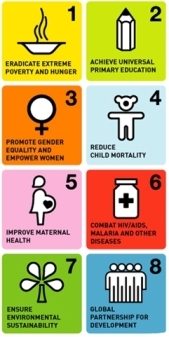 In fact, it is a gateway for making progress toward all the UN MDGs. This film is an excellent educational tool for grade levels 7 to 12, college, and adults. It can be obtained as a DVD that includes 28-minute and 45-minute versions. This film is highly recommended. Point of contact: Stephanie Miller. 3. Shop Till You Drop? 4. Are You Buying This? 5. What Makes a Civilization Sustainable? 4. What Is Good Governance? "This activity-based curriculum unit for high school social studies teachers contains eight engaging and inspiring lessons that help students build the connections between economics, history, democracy, and sustainability. Each lesson in the two-week unit is aligned with the National Council for the Social Studies' curriculum standards for easy classroom integration. For every topic covered, students learn creative tools to contribute toward sustainable solutions in their local and global communities." Available now as a downloadable PDF. Hard copies forthcoming. Highly recommended for high school teachers. Point of contact: Cecilia Lund. This book has just been release by Palgrave. 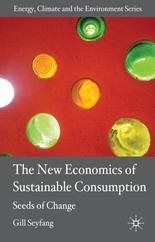 It bridges the gap between new economic theories and the new consumption patterns that will be required for sustainable economies to materialize. The author is Gill Seyfang, a researcher at the University of East Anglia's Centre for Social and Economic Research on the Global Environment (CSERGE). Palgrave points of contact: Kathryn Treeby (UK), Alaina Kunin (USA). This book has just been release by Peter Lang Publishers. The book reports "the emerging set of complex relationships between creativity, design, research, higher education and knowledge capitalism." The author is Michael Peters, Professor of Educational Policy Studies, University of Illinois at Urbana-Champaign. For more information about the content, click here. Visit the Sustainability at the National Academies web site, a repository of cutting edge research on the sustainability sciences. Note: The full report (13MB) or individual sections can be downloaded free of charge. Comments on the draft report will be accepted through close of business Friday 27 February 2009. See the Invitation to Comment on Second Public Review Draft and the Instructions for Submission of Comments on Second Public Review Draft. For further information please contact Dr. Fabien Laurier including "USPinfo" in the subject line. What have I done to foster solidarity, sustainability, and nonviolence? What am I doing to foster solidarity, sustainability, and nonviolence? What shall I do to foster solidarity, sustainability, and nonviolence?